Abstract: Publishing in scholarly peer reviewed journals usually entails long delays from submission to publication. In part this is due to the length of the peer review process and in part because of the dominating tradition of publication in issues, earlier a necessity of paper-based publishing, which creates backlogs of manuscripts waiting in line. The delays slow the dissemination of scholarship and can provide a significant burden on the academic careers of authors. Using a stratified random sample we studied average publishing delays in 2700 papers published in 135 journals sampled from the Scopus citation index. The shortest overall delays occur in science technology and medical (STM) fields and the longest in social science, arts/humanities and business/economics. Business/economics with a delay of 18 months took twice as long as chemistry with a 9 month average delay. Analysis of the variance indicated that by far the largest amount of variance in the time between submission and acceptance was among articles within a journal as compared with journals, disciplines or the size of the journal. For the time between acceptance and publication most of the variation in delay can be accounted for by differences between specific journals. 1. The research community is clamoring for access, particularly those who are denied access to articles in journals to which their institutions cannot afford to subscribe. 2. In many fields, the most important growth region for taking up and building upon new findings, hence research progress, is within the first year of publication. 4. Björk and Solomon point out that for Gold OA journals the delay is much shorter: under 2 months. 5. The delay for Green OA self-archiving is even shorter: zero if self-archiving is immediate (and even negative if a pre-refereeing preprint has also been made OA even earlier). 6. Subscription journals say they are in favor of OA, but they need an embargo in order to keep their subscriptions sustainable. 7. Subscription journals already have a built-in "embargo" because of the 6-month delay between acceptance and publication. 8. So the 6-12-month Green OA embargoes demanded by STEM fields and even longer embargoes demanded by arts & humanities journals not only impede research progress by denying access during the embargo, but they compound the publisher-end delays between acceptance and publication. It makes it possible for researchers to request -- and authors to provide -- immediate access with one click each as soon as the final, refereed, revised draft is accepted for publication, irrespective of publication lags or publisher OA embargoes. (1) Stevan trades off expected speed of achieving OA against quality of the resulting OA. It's his right to do that. I just point out that that's what it is. That's my right. He calls it 'deprecating green OA'; I prefer to call it 'comparing outcome'. (2) My 'jumping with a closed parachute' is not in any way a criticism of green OA or advocating green OA. It is a criticism of presenting green OA (in which the publication of articles is being paid for by subscriptions) as the only way until all scholarly literature is available as green OA, and only then considering alternatives to the subscription system. I consider that deeply unrealistic, utterly unfeasible and not viable, and I favour developing gold OA as a replacement of the subscription system alongside green OA, gradually replacing the subscription system. (3) The agreement reached at the BOAI to pursue both strategies (later called green and gold) proved short-lived. This has been most unfortunate, in my view. Stevan has introduced the idea that gold and green are rivalrous. They aren't. They both contribute to growing OA. They both come with a transition price. In one case the price is lower quality of the resulting OA; in the other it is money. TRADING OFF -- OR OFF-LOADING TRADE? Green vs. Gold is not a question of rivalry, it's a question of priority. The twin reasons why Green has to come first are very simple: (i) Gold OA journal publishing is vastly over-priced today and (ii) the money to pay for Gold OA (even if it is downsized to a fair, affordable price) is still locked into institutional journal subscriptions. Institutions can only cancel subscriptions when the subscribed content is available as Green OA. Until then they can only double-pay (whether for hybrid subscription/Gold journals or for subscription journals plus Gold journals). And publishers will not unbundle and cut costs to the minimum (peer review service alone, nothing else) until cancellations force them to do so. And (before you say it): If a new Gold OA journal enters the market today with a truly rock-bottom price, for the peer-review service alone, the money to pay for it is still over and above what is being paid for subscriptions today, because the subscriptions cannot be cancelled until most journals (or at least the most important ones) likewise downsize to the bare essentials. And most journals are not downsizing to the bare essentials. And institutions and funders cannot make journals downsize. All institutions and funders can do is pay them even more than what they are paying them already (which is exactly what the publisher lobby has managed to persuade the UK and the Finch Committee to do). I do not call that a "parachute" toward a "soft landing": I call it good publisher PR, to preserve their bottom-lines. And for most institutions and funders, it not only costs more money, but it is even more unaffordable and unsustainable than the serials status-quo today (which is reputedly in crisis). The promise from hybrid Gold publishers to cut subscription costs in proportion to growth in Gold uptake revenues, even if kept, is unaffordable, because it involves first paying more, in advance; and all it does is lock in the current status quo insofar as total publisher revenue is concerned, in exchange for OA that researchers can already provide for themselves via Green, since publication and its costs are already being fully paid for -- via subscriptions. Nor is "price competition" the corrective: Authors don't pick journals for their price but for their quality standards, which means their peer-review standards. It would be nothing short of grotesque to imagine that it should be otherwise (think about it!). The corrective is global Green OA mandates: That -- and not "price competition" between Gold OA journals -- will see to it that the huge, unnecessary overlay of commercially co-bundled products and services that scholarly journal publishing inherited from the Gutenberg (and Robert-Maxwell) era is phased out and scaled down, at long last, to the only thing that scholars and scientists really still want and need in the online era, which is a reliable peer review service, provided by a hierarchy of journals, in different fields, each with its own established track record for quality -- hence selectivity -- at the various quality levels required by the field. So what's at issue is not a trade-off of "speed" vs. "quality" (whether peer review quality, or re-use/text-mining rights) at all, but a trade-off of speed vs. the status quo. And yes, that's speed, in the first instance, toward 100% free online access (Gratis OA) -- of which, let us remind ourselves, we currently have only about 25% via Green and maybe another 12% via Gold -- because that is what is within immediate reach (although we have kept failing to grasp it for over a decade). The rest of the "quality" -- Gold OA and Libre OA -- will come once we have 100% Green OA, and publishers are forced (by Green-OA enabled subscription cancelations, making subscriptions no loner sustainable) to downsize and convert to Gold. But not if we keep playing the snail's-pace game of double-paying pre-emptively for Gold while research access and impact keeping being lost, year upon year -- all in order to cushion the landing for the only ones that are comfortable with the status quo (and in no hurry! ): toll-access publishers. And please let's stop solemnly invoking the BOAI as a justification for continuing this no-sum, no-win game of no-OA unless you double-pay. Publication costs are being paid, in full (and fulsomely) today. What's missing is not more revenue for publishers, but OA. And Green OA mandates will provide it. The rest will take care of itself, as a natural process of adaptation, by the publishing trade, to the new reality of global Green OA. Eric Van de Velde: "Green Open Access delivers the immediate benefit of access. Proponents argue it will also, over time, fundamentally change the scholarly-communication market. The twenty-year HEP record lends support to the belief that Green Open Access has a moderating influence: HEP journals are priced at more reasonable levels than other disciplines. However, the HEP record thus far does not support the notion that Green Open Access creates significant change…"
Twenty years of Open Access in HEP is not a significant change? Eric Van de Velde: "If SCOAP³ proves sustainable, it will become the de-facto sponsor and manager of all HEP publishing world-wide. It will create a barrier-free open-access system of refereed articles produced by professional publishers. This is an improvement over arXiv, which contains mostly author-formatted material." Committing a worldwide institutional consortium into paying roughly the same as what it's paying now, in exchange for OA to publisher PDF instead of author versions? "Those who observe with scientific detachment merely note that, after twenty years of 100% Green Open Access, the HEP establishment really wants Gold Open Access." With still more detachment, it sounds as if HEP researchers really wanted -- and gave themselves-- a barrier-free open-access system of refereed articles 20 years ago. What the research community needs, urgently, is free online access (Open Access, OA) to its own peer-reviewed research output. Researchers can provide that in two ways: by publishing their articles in OA journals (Gold OA) or by continuing to publish in non-OA journals and self-archiving their final peer-reviewed drafts in their own OA Institutional Repositories (Green OA). OA self-archiving, once it is mandated by research institutions and funders, can reliably generate 100% Green OA. Gold OA requires journals to convert to OA publishing (which is not in the hands of the research community) and it also requires the funds to cover the Gold OA publication costs. With 100% Green OA, the research community's access and impact problems are already solved. If and when 100% Green OA should cause significant cancellation pressure (no one knows whether or when that will happen, because OA Green grows anarchically, article by article, not journal by journal). Then the cancellation pressure will cause cost-cutting, downsizing and eventually a leveraged transition to OA (Gold) publishing on the part of journals. As subscription revenues shrink, institutional windfall savings from cancellations grow. So if and when journal subscriptions become unsustainable, per-article publishing costs will be low enough, and institutional savings will be high enough to cover them, because publishing will have downsized to just peer-review service provision alone, offloading text-generation onto authors and access-provision and archiving onto the global network of OA Institutional Repositories. Green OA will have leveraged a transition to Gold OA. And, yes, SCOAP3 is indeed pointless pre-emptive lock-in of the status quo (engineered by some academics and some libraries -- certainly not by "academia") in a field (HEP) that already has Green OA, unmandated, and could instead be doing so much more to support and promote mandated Green OA in all other disciplines. But it's still far from over. Green OA mandates are imminent in the EU, Australia, and perhaps at long last in the US. And RCUK may still fix its policy into a workable one, despite the Finch Fiasco. "The 'sin' that RCUK, Finch and the Wellcome Trust committed is that they didn't formulate their policies according to strict Harnadian orthodoxy. It's not that they forbid Harnadian OA (a.k.a. 'green'). It is that they see the 'gold' route to OA as worthy of support as well. Harnad, as arbiter of Harnadian OA (he has acolytes), would like to see funder and institutional OA policies focus entirely and only on Harnadian OA, and would want them, to all intents and purposed, forbid the 'gold' route... It is the equivalent of opening the parachute only a split second before hitting the ground. " "In general I'm with Stevan on this. The RCUK policy and the Finch recommendations fail to take good advantage of green OA. Like Stevan, I initially overestimated the role of green in the RCUK policy, but in conversation with the RCUK have come to a better understanding. In various blog posts since the two documents were released, I've criticized the under-reliance on green. I'm doing so again, more formally, in a forthcoming editorial in a major journal. I'm also writing up my views at greater length for the September issue of my newsletter (SPARC Open Access Newsletter). "For more background, I've argued for years that green and gold are complementary; I have a whole chapter on this in my new book . So we want both. But there are better and worse ways to combine them. Basically the RCUK and Finch Group give green a secondary or minimal role, and fail to take advantage of its ability to assure a fast and inexpensive transition to OA." "If the UK first... — clearly and unambiguously mandates Green OA for all UK research output — then it is welcome to throw all the cash it has to spare on also subsidizing Gold OA if it so wishes. --- But not instead." "The [Green OA] policies of neither research funders nor universities themselves have yet had a major effect in ensuring that researchers make their publications accessible in institutional repositories… [so] the infrastructure of subject and institutional repositories should [instead] be developed [to] play a valuable role complementary to formal publishing, particularly in providing access to research data and to grey literature, and in digital preservation [no mention of Green OA]…"
The crucial contingency, and the one that caused all the confusion about whether or not RCUK is truly continuing "to support a mixed approach" is that if a journal offers Gold, RCUK fundees must choose Gold. If so, the only thing that any subscription journal needs to do to ensure that RCUK authors cannot choose Green (and hence must pay for Gold) is to offer hybrid Gold. That's the contingency that needs to be clearly and unambiguously dropped in order to fix the RCUK OA mandate and bring it into line with the EC mandate, as well as the adopted and planned OA mandates in the US. "Based on this analysis, the main findings are:  so long as research funders commit to paying publication costs for the research they fund, and  publication charges fall to the reprint author’s home institution,  all universities would see savings from (worldwide) Gold OA when article-processing charges are at the current averages,  research-intensive universities would see the greatest savings, and  in a transition period, providing Open Access through the Green route offers the greatest economic benefits to individual universities, unless additional funds are made available to cover Gold OA costs....[F]or all the sample universities during a transition period when subscriptions are maintained, the cost of adopting Green OA is much lower than the cost of Gold OA - with Green OA self-archiving costing institutions around one-fifth the amount that Gold OA might cost, and as little as one-tenth as much for the most research intensive university sampled. In a transition period, providing OA through the Green route would have substantial economic benefits for universities, unless additional funds were released for Gold OA, beyond those already available through the Research Councils and the Wellcome Trust...."
Swan, Alma & Houghton, John (2012) Going for Gold? The costs and benefits of Gold Open Access for UK research institutions: further economic modelling. Report to the UK Open Access Implementation Group. JISC Information Environment Repository. 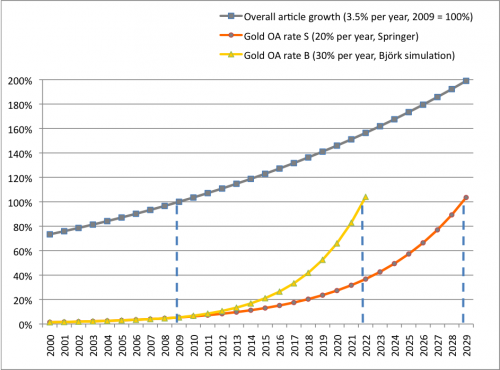 The biggest risk from Gold OA (publishing) (and it's already a reality) is that it will get in the way of the growth of Green OA (self-archiving), and hence the growth of OA itself. That's Gold Fever: Most people assume that OA means Gold OA, and don't realize that the fastest, surest and (extra-)cost-free way to 100% OA is to provide (and mandate) Green OA. Harnad, S. (2005) Fast-Forward on the Green Road to Open Access: The Case Against Mixing Up Green and Gold. Ariadne 42. Harnad, S. (2007) The Green Road to Open Access: A Leveraged Transition. In: Anna Gacs (ed). The Culture of Periodicals from the Perspective of the Electronic Age. L'Harmattan. 99-106. The publishing community can afford to be leisurely about how long it takes for open access (OA) to reach 100% (it's 10% now for Gold OA publishing, plus another 20% for Green OA self-archiving). But the research community need not be so leisurely about it. Research articles no longer need to be accessible only to those researchers whose institution can afford to subscribe to the journal in which it was published, rather than to all researchers who want to use, apply and build upon it. Lost research access means lost research progress. Research is funded, conducted and published for the sake of research progress and its public benefits, not in order to provide revenue to the publishing industry, nor to sustain the subscription model of cost-recovery. The publishing community is understandably "wary" about Green OA self-archiving, mindful of its subscription revenue streams. But the transition to Green OA self-archiving, unlike the transition to Gold OA publishing, is entirely in the hands of the research community, which need not wait passively for the "market" to shift to Gold OA publishing: Springer publishers' projections suggest that at its current growth rate Gold OA will not reach 100% till the year 2029. The research community need not wait, because it is itself the universal provider of all the published research, and its institutions and funders can mandate (i.e., require) that their authors self-archive their peer-reviewed final drafts (not the publishers' version of record) in their institutional Green OA repositories immediately upon acceptance for publication. And a growing number of funders and institutions (including all the UK funding councils, the ERC, EU and NIH in the US, as well as University College London, Harvard and MIT) are doing just that. Green OA self-archiving mandates generate 60% OA within two years of adoption, and climb toward 100% within a few years thereafter. The earliest mandates (U. Southampton School of Electrons and Computer Science, 2003, and CERN, 2004 are already at or near 100% Green OA. Harnad, S. (2011) Open Access to Research: Changing Researcher Behavior Through University and Funder Mandates. JEDEM Journal of Democracy and Open Government 3 (1): 33-41. ABSTRACT: The primary target of the worldwide Open Access initiative is the 2.5 million articles published every year in the planet's 25,000 peer-reviewed research journals across all scholarly and scientific fields. Without exception, every one of these articles is an author give-away, written, not for royalty income, but solely to be used, applied and built upon by other researchers. The optimal and inevitable solution for this give-away research is that it should be made freely accessible to all its would-be users online and not only to those whose institutions can afford subscription access to the journal in which it happens to be published. Yet this optimal and inevitable solution, already fully within the reach of the global research community for at least two decades now, has been taking a remarkably long time to be grasped. The problem is not particularly an instance of "eDemocracy" one way or the other; it is an instance of inaction because of widespread misconceptions (reminiscent of Zeno's Paradox). The solution is for the world's research institutions and funders to (1) extend their existing "publish or perish" mandates so as to (2) require their employees and fundees to maximize the usage and impact of the research they are employed and funded to conduct and publish by (3) depositing their final drafts in their Open Access (OA) Institutional Repositories immediately upon acceptance for publication in order to (4) make their findings freely accessible to all their potential users webwide. OA metrics can then be used to measure and reward research progress and impact; and multiple layers of links, tags, commentary and discussion can be built upon and integrated with the primary research. The Royal Society is fully green again, endorsing unembargoed OA self-archiving of the author's final draft, immediately upon acceptance for publication, thereby reinstating the world's most venerable publisher on the side of the angels, where it belonged all along, historically. With much gratitude from the research community and posterity! "Green open access: Authors may deposit a pre-print of their article in a repository at any time and they may deposit the final, accepted manuscript version of their article in a repository from 12 months after publication." Whereas one can be agnostic about the hybrid gold OA option that the RS and many publishers are offering (including the promise of transparency in translating hybrid Gold OA uptake increases into subscription price reductions), this takes on an entirely different complexion if the publisher is not Green (as, for example, CUP, APS, IOP, AAAS, Springer and Elsevier all are, whereas OUP and NPG, and now possibly the RS, are not). For if the publisher imposes a 1-year embargo, that is tantamount to a constraint -- on any author that needs and wants immediate OA -- to pay for the hybrid Gold OA option instead of just providing Green OA.